The new miniature System on Module based on NXP’s i.MX 8M Mini processor provides a pin2pin scalable option to Variscite’s DART-MX8M with lower power consumption and higher CPU performance. Variscite is pleased to announce its selection as NXP’s alpha partner to the upcoming i.MX 8M Mini processor. The DART-MX8M-MINI, a miniature System on Module, based on the i.MX 8M Mini, will be launched together with NXP’s official launch of the processor and will offer Variscite’s customers the ultimate flexibility when designing their future products with the DART-MX8M pin compatible family. Variscite is the only NXP partner who received early access to all i.MX8 alpha programs: i.MX 8QM, i.MX8M, i.MX 8X and i.MX 8M Mini (Nano is expected to follow in 2019). 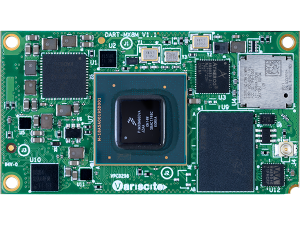 With the launch of the first i.MX8 product – the DART-MX8M earlier this year, Variscite has started to realize its plans to develop products based on each of these processors. Now, we are pleased to announce the upcoming launch of the DART-MX8M-MINI, which will take place simultaneously with NXP’s i.MX 8M Mini official launch. The DART-MX8M-MINI and the DART-MX8M are pin-compatible solutions, providing our customers with ultimate flexibility. This feature enables customers to develop scalable platforms supporting either 4K video decode/display with USB3 support using the DART-MX8M, or 1080p video encode and decode with lower power and higher CPU processing using the DART-MX8M-Mini. Additionally, customers targeting the DART-MX8M-MINI can start developing their system today on the production-ready DART-MX8M, and easily replace it later with the DART-MX8M-MINI to enjoy its upgraded features. Up to 2GHz Single/Dual/Quad-core ARM Cortex-A53 plus 400MHz Cortex-M4 real-time processor, leveraging advanced low power silicon process technology to provide optimized power consumption while maintaining a high-performance bar. The i.MX 8M Mini integrates HW engines supporting 1080p video encode and decode, 2D and 3D graphics, HQ audio and a wide range of connectivity options such as Wi-Fi/BT, Ethernet and USB. The following comparison chart demonstrates the main differences between Variscite’s i.MX 8M Mini based SoM and i.MX 8M based SoM. As NXP’s alpha partner, Variscite will launch its DART-MX8M-MINI along with NXP’s upcoming launch of the i.MX 8M Mini processor. For early access and additional information leave us a note on our contact us page.